The Los Angeles Lakers are back and so is The Scoop! As we all know, the regular game season is what's most important, but preseason will give us an idea of what's in store with our (hopefully) new and improved Lakers team. It's gametime, so let's go Lakers! I have a feeling that more people are interested in watching the preseason this year, because it's been way too long since we've seen Kobe play. 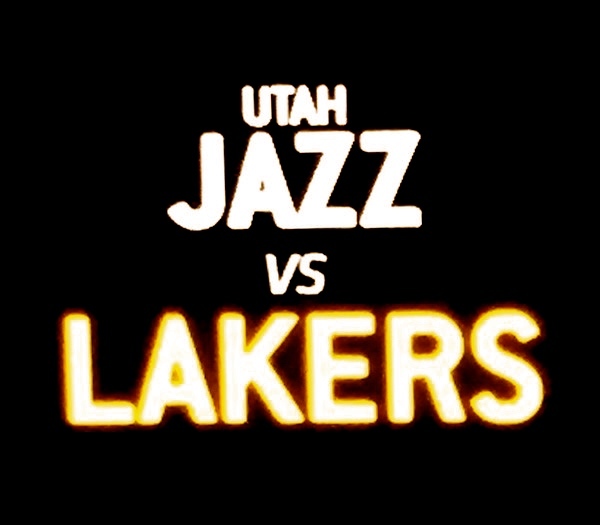 Tonight the Los Angeles Lakers are teaming up against the Utah Jazz in Hawaii. Kobe Bryant is going to play his first game in nearly 9 months now. Hopefully, Kobe will be able to do what he does best, and score some baskets. I'm looking forward to seeing some great basketball tonight with a lot of effort and teamwork from all of our new and old Lakers. What's great about our new Lakers team is that it seems like we have all of the right players now for the development of a good, solid foundation. Unfortunately, tonight we're not going to be seeing Larry Nance Jr. make his Lakers debut, because of some minor back issues, but he's something we have to look forward to. I can't wait to see D'Angelo Russell turn on his fire. He's our second overall pick and he's supposed to be a phenomenal player. Hopefully, he's had some time to build up some chemistry between the summer league and the training camp with some of the other players like Jordan Clarkson, Julius Randle, and all of other greats, especially, our MVP. Kobe's back baby! Despite what everyone else is saying, I don't think this will be Kobe's final year. I definitely see him pushing himself a little bit longer, or at least, as much as he can. Our Lakers starters tonight are Kobe Bryant, Julius Randle, Roy Hibbert, Jordan Clarkson, and D'Angelo Russell. D'Angelo Russell gave a nice bounce pass to Julius Randle for the first basket for the Lakers tonight. Clarkson just hit one off the glass for two points. Twice in a row for Clarkson for some nice fast-break points! Yikes, Lakers are falling behind, missing a few shots early in this first quarter. It's starting to seem like Kobe Bryant is the teacher for this Laker team, but I want to see him turn it up himself as well. Kobe just made his first shot this preseason from a technical foul. Oh man, Kobe just hit his famous sideline shot! He's so bad, I mean good! Roy Hibbert seems to be hustling well and protecting the rim nicely. So far so good, these Lakers look like a big improvement from last season, that's for sure! Maybe last year was like one large hiccup? Lou Williams just stepped into the game. Let's see if this boy can shoot as good as they say. As well, Brandon Bass is in the game now, new to the Lakers, coming from the Celtics. As Kobe stays in the game, let's see what damage these guys can do. Kobe's one for five in this first quarter. This was a very slow offensive first-quarter for the Lakers. The Jazz are ahead by two with a score of 18 to 6, heading into the second quarter. The best part of this quarter was that Mamba played the entire quarter. Nick Young, Robert Sacre, and Jabari Brown are in the game. Let's see how well they play with some of these new guys. I just saw one of the best over the head, behind the back passes from Lou Williams to Brandon Bass. Elijah Millsap just made a nice airball. He's the oldest player for the Jazz right now. Not that age had anything to do with that airball, because it didn't. Lou Williams just lost the ball, got it back with Millsap on his back, giving him a bear hug for a jump ball. I haven't seen a bear hug for a jump ball like that, since I watched my daughter play in the minor leagues. Lou Williams just got a nice three-point play. I just love how aggressive Jabari Brown plays. He really knows how to turn it up, even for a preseason game. Nice to see Tarik Black in the game again, as he throws up a nice hook shot. In case you didn't hear, no other than Metta World Peace is back on the Lakers! He's such a passionate, aggressive player, and I'm hoping he can help us get another ring this year. I'm glad he's back with the Lakers. Lou Williams really turned it on in this first half. He seems to be a very energetic and determined player. I think I found a new favourite Lakers player. With 1.1 seconds left in the half, Swaggy P hits a nothing but net shot from long-distance. The Lakers take the lead going into the half with a score of 33-38 Lakers. Nick Young just hit his second three of the game. Jordan Clarkson just made another great play, making contact, getting an and 1. Loving the way Jordan Clarkson elevates in nearly all of his shots. He's such a phenomenal player! It looks like Kobe Bryant is going to be sitting out for the remainder of the game, because they don't want to push him too hard during preseason. That makes sense to me, despite wanting to see him play for my own selfish reasons. In all honesty, he doesn't seem like the same Kobe Bryant anymore, which anyone that knows me, knows how hard that is for me to admit. But, I suppose that's what happens with age in basketball, even when you're an MVP. So I guess Kobe will have to chill on the bench a bit keeping MWP company. Julius Randle just hit the deck hard and man, is he resilient! He jumped up as if nothing happened, and I swear the whole court shook. Heading into the fourth quarter and the Lakers are up by two. I can honestly say that this Lakers team has already impressed me, and this is just the first preseason game. All of the crowd at the University of Hawaii are going mad in chanting Kobe's name here in this fourth-quarter, wanting him to play. Yea, yea, we all feel the same way, but he's gotta rest up. The Lakers just lost their lead, but we're basically just seeing what we need to see in this game. Everything is new for these Lakers now, from having an opponent that's not one of their own teammates, to simply getting used to all of the new faces and players. It all takes a little getting used to, but this was a good first preseason game. Anthony Brown just hit a 25 foot three point jumper, Lou Williams getting the assist. The crowd in Hawaii seems a lot louder than here at The Staples Center. As much as I hate sounding like a hater, Why is Ryan Kelly still playing for the Lakers. Why exactly didn't we trade him. Well, we started off pretty good, but it turned into somewhat of a blowout game with a final score of 90-71 Jazz.